PowerDirector 15 Ultra Limited Time SALE Ending Soon! 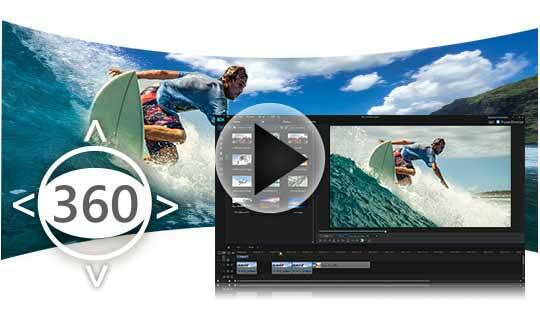 HD, 4K & 360º video: Edit it all with our best version ever! 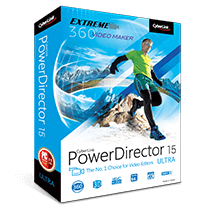 PowerDirector 15 Ultra Full Version, Unmatched Video Editing. 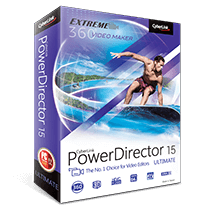 PowerDirector 15 Ultimate More Effects, More Creativity. NEW $800+ of pro effects! 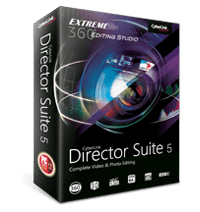 Director Suite 5 4-in-1 Power, Complete Video & Photo Editing. NEW $1,000+ of pro effects! Limited Time SALE with Our Master Bundle - Ending Soon! Effortless Color Grading, Stylize Your Video Instantly! Offers the means to dramatically improve your projects through use of tools to control color and lighting. 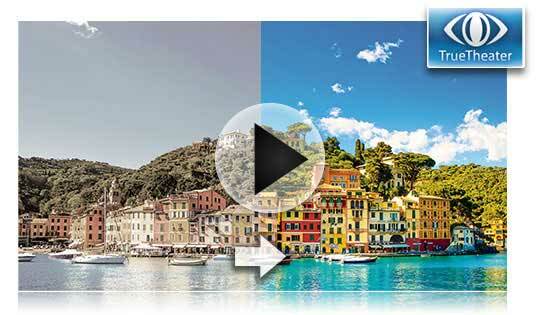 New color splash feature can quickly add drama and focus to your videos. Effortless round-trip editing with PowerDirector 15. Great audio is the key to giving your videos compelling emotion. 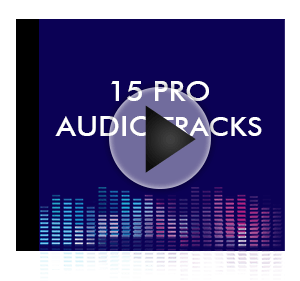 With 10 music tracks and 5 sound effects from Muserk, you can now add a professional grade atmosphere to your videos. Express Yourself with the Ultimate Movie Making Toolkit! With 25 Express Project templates and 550+ effects including transitions, titles, PiPs, particles and blending effects, along with unique customizable design tools, you can add more flexibility & fun to your videos. 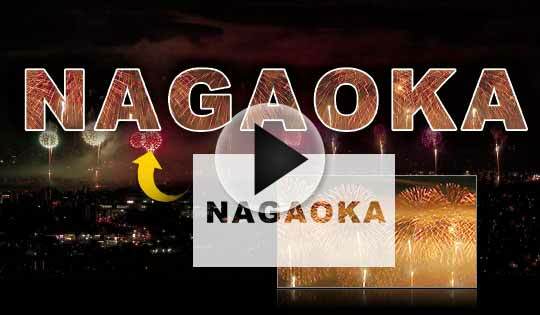 Apply selective transparency to text and images to fuse different video clips together and create impressive special effects. Use blending effect presets or merge two clips with 8 blending modes to create unique impact to your videos. Choose some sunset footage then blend with your skating video to give a rich, warm summer feel. View Designer is an innovation that enables you to choose & switch desired angles in a 360° video footage and create your own 2D narrative movie. Customize titles with non-linear motion, font size, gradient color, border, blur level, transparency and reflection. 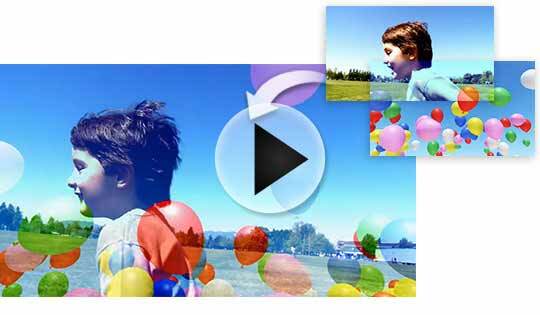 Overlay animated objects now with non-linear motion on your videos and use simple transforming tools to create engaging video collages. Attach auto-resized effects and text on moving objects to emphasize what you want to highlight. 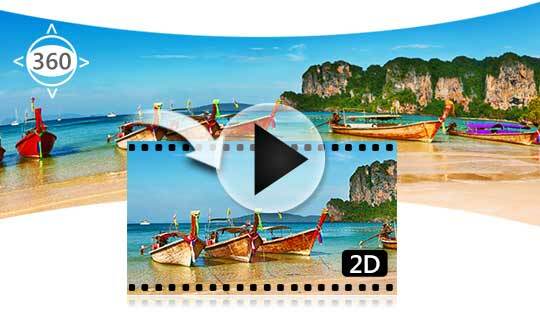 Create transitions from any image using alpha channel masks to set the shape. Design particle effects using your own graphic objects and built-in animated effects. A Virtual 360º Video Playground! PowerDirector makes it easy to create spectacular new 360º videos using the same intuitive design tools you know and love. It's a whole new perspective on movie making. 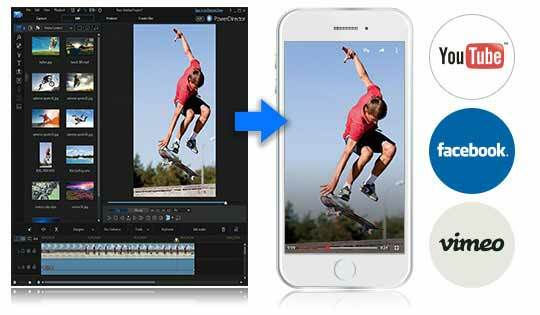 PowerDirector now supports end-to-end 360º video editing. Import equirectangular footage, create a 360º project, edit with a full range of design tools, then export in 360º format. Now you can add titles, transitions and PiP objects into your 360º videos for viewers to discover as they explore your creation. TrueTheater® Color makes it easy to create Hollywood-style videos with just a click, dynamically adjusts the color saturation in video, intelligently recognizes skin tones in footage and applies only subtle adjustments to these areas, while protecting skin tone from distortion. Also can be applied in 360º projects. Say Goodbye to Black Bars for Mobile Videos! Faster. Smoother. Better Than Ever! Powered by cutting edge video rendering and production technologies, and supporting the latest video formats. PowerDirector is ready to tackle any video project. 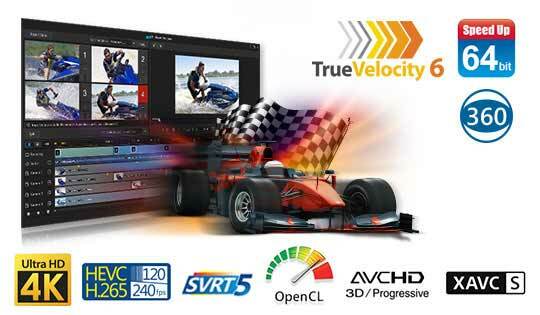 NEWTrueVelocity 6 - 64-bit powerhouse offering smoother and faster production than other video editing software. NEW / UNIQUESmart Video Rendering Technology (SVRT) 5 - only renders segments of footage that have been modified to increase production speed. EXPANDEDMore Formats and Codecs - includes 360º, 4K UltraHD, AVCHD 3D/Progressive, XAVC-S, AAC and H.265. Import 120/240fps slow motion footage from your iPhone, GoPro or other action sports cameras. Full Version, Unmatched Video Editing. 4-in-1 Power, Complete Video & Photo Editing.